The Association FuturoDigitale, acting as “MOVE Agent”, it coordinated an event again this year for the 2015 Edition of the MOVE Week, now in its 4th Edition, held throughout Europe from 21 to September 27, 2015. The move week was devoted to the theme of rights (right to movement, right to health, the right to a healthy lifestyle) and had as its slogan “MOVE FOR YOUR RIGHTS”. With its 38 participating countries, 1,147 city, 3,200 MOVE Agent, 6,980 1,640,000 participants and events across Europe, the MOVE Week 2014 was an extraordinary success, well above expectations. In Italy the MOVE Week, coordinated by UISP, attained levels of involvement and participation in incredibly high, with 118 cities involved, MOVE Agent 138, 377 events, 71,500 3,582 volunteers and participants. The 2015 Edition was also a success in terms of participation by citizens and associations. FuturoDigitale achieved the 2015 event at the headquarters of Sant’Antonio Abate (Na), in the parish Center Santa Maria Nova. The event, held Saturday, September 26, 2015, involved 100 boys of ACR between the ages of 12 and 14 years, 30 animators and volunteers of the Centre and of the Association, as well as dozens of citizens. 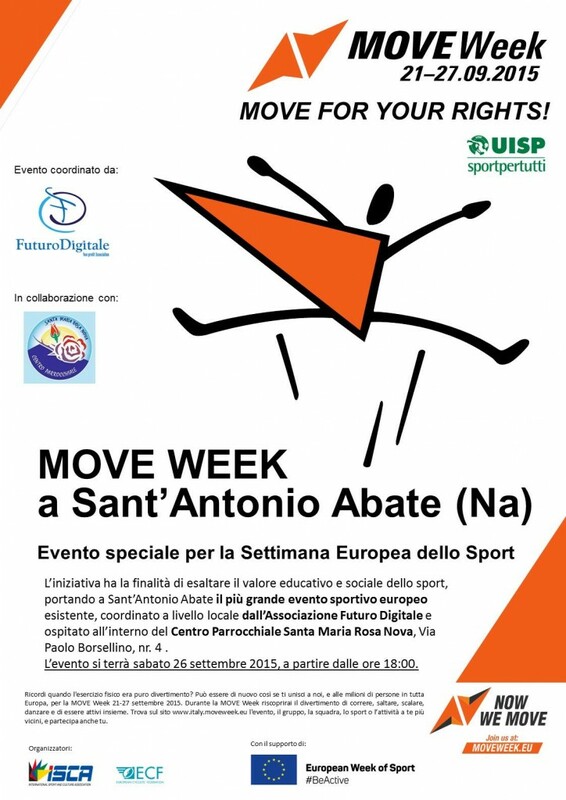 For the first time the MOVE Week has arrived on the territory of Saint Anthony, housed in a center that recognizes the social and educational value of sport as a tool for growth of young people. Were organized in the course of the afternoon games, sports such as basketball, badminton, table tennis, soccer and dodgeball, in the form of tournament, with prize-winning team “tournament MOVE Week 2015”. The winning team was awarded a Cup, put up for grabs from digital future, while for others there were gadgets and t-shirts. Overall, many citizens were involved and young abatesi, to affirm the educational value of sport. It was an important moment for our country and much appreciated by young people and by young people in particular: Europe comes to Saint Anthony, bringing positive values and founding principles of European citizenship. Main partners of the event were the parish Center Santa Maria Rosa Nova Dodgeball Association Sant’Antonio Abate and the Forum of associations Abatesi.